The book is full of lovely, hair-raising, and even nail-biting stories of heroism. There’s the story of Sergeant Stubby, a pit bull terrier mix and World War I hero that was the first dog to be given rank in the U.S. Armed Forces. He served 19 months oversees and survived 17 battles, during which time he captured German spies, alerted the soldiers of incoming shells so they could dash to safety, led lost soldiers to safety, and even sniffed out gas attacks. But he had a humorous side and loved to entertain the troops by saluting officers with one paw. There are other wonderful stories about military mascots, including Sergeant Major Jiggs, an English bulldog who appeared on a WWI recruitment poster in full military dress; Bamse the St. Bernard who became a national hero in Norway when he saved the lives of two sailors; and other dashing dogs that have served the Navy Seals, received the Australian Purple Cross, and even performed search and rescues during earthquakes or natural disaster. This is amazing book offers prose that is fast-paced and super-factual, but is written in a conversational style that keeps readers engaged to the fullest. There are sidebars on the types of rewards to give when dogs do well, how military dogs are matched with a handler, how military dogs are trained to detect explosives, how police dogs are protected, how to train your own dog, and even what the “fighters of the future” will look like. This is a National Geographic book, so the pictures live up to their brand. Whether black-and-white (like the photos from WWI) or full color, the pictures of these working dogs that have braved bullets and imminent danger but still manage to maintain a cute little doggie smile on their muzzles will definitely pull at the heart strings. 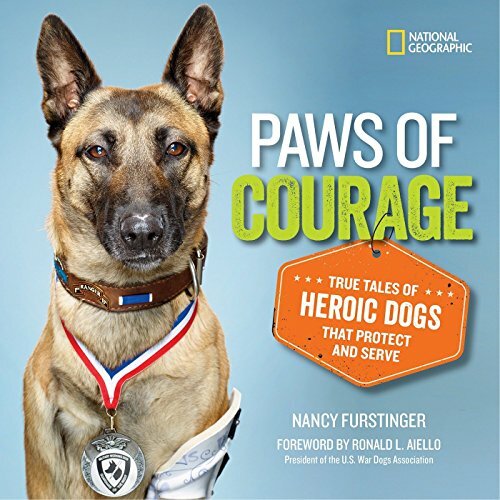 Great for animal lovers, ROTC classes, discussions about occupations, or any dog trainer’s personal library.